Runtime: 2 hr. 15 mins. Fathom Events and GKIDS are excited to bring Hayao Miyazaki's Spirited Away to movie theatres nationwide for a special three-day event on October 28, 29 & 30 as part of Studio Ghibli Fest 2018. Wandering through an abandoned carnival site, Chichiro is separated from her parents and stumbles into a spirit world where she is put to work. Here she encounters impossibly inventive characters and must find the inner strength to outsmart her captors and return to her family. 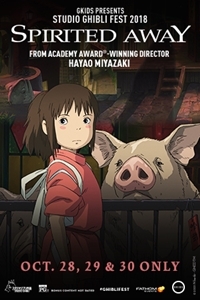 Winner of the Academy Award® for Best Animated Feature and overflowing with imaginative creatures and thrilling storytelling, Spirited Away became a worldwide smash hit, and is one the most critically acclaimed films of all time.